In recent years, the spread of inspections and other forms of enforcement (audits, surveys, vetting, assurance etc.) has reached a stage of ‘explosion’ in terms of both scope and frequency. There is a real concern that the enforcement regime, i.e. compliance with rules, regulations and industry standards, has fallen victim to its original intentions of managing safety risks. Many seafarers I have interviewed believe that onboard inspections are merely paying lip service to regulatory and commercial obligations and not necessarily addressing genuine safety risks. These responses are neither exaggerated nor isolated; similar issues have emerged during many discussions with the seafarers and the managers ashore. The managing director in one company explained how a major accident within the fleet brought to surface some serious safety issues despite the vessel ‘flying through every inspection and audit for the past few years’. In another case, an inspector made an observation that there should be a ‘hold the hand rails’ sign next to the accommodation ladders for crew safety. (Note – Several studies have shown that excessive use of warning signs leads to risk blindness – workers simply stop paying attention to warning signs.) Nobody onboard could recall if the structural strength and maintenance of the accommodation ladders were examined with the same spirit by the inspector. Collectively, all these anecdotes highlight systemic problems in the enforcement regime and a lack of appreciation, or at least focus, on genuine safety risks. Safety, it appears, has become a joke in global shipping. What explains the mismatch between the representatives of the enforcement regime (inspectors, surveyors, auditors and SHEQ staff) and those onboard? Why is the focus of onboard inspections (commercial, regulatory and internal alike) so much on petty issues whilst leaving aside the major risks? Are there alternatives to our existing approach to onboard inspections? What can we learn from other high risk industries in making the enforcement regime an effective tool for risk management? These questions will be answered in the body of this paper. Recognising there is a problem and discussing it honestly and openly is the first step towards resolving it. 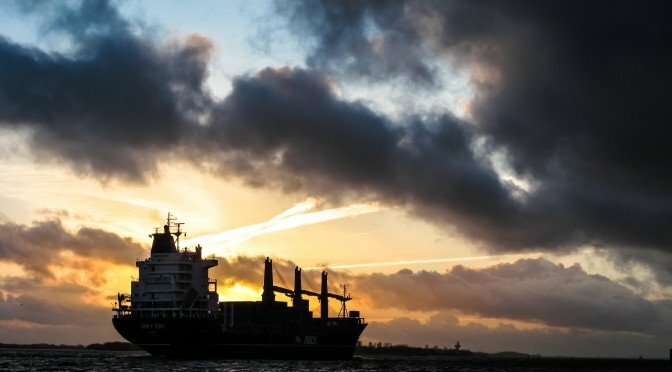 Economic turbulence is affecting almost every business worldwide and the maritime industry is no exception. Most public and private bodies conducting onboard inspections are facing resource and budget constraints. Ships and ship operations have grown increasingly complex. Hull, machinery, navigation, cargo loading systems, fire and lifesaving systems, safety management systems, are all vast disciplines of expertise on their own. Expecting any one inspector to accurately and meaningfully apply the relevant regulatory instruments is a challenge. Regulatory bodies try hard catching-up with fast paced technologies but this only adds to the scope of inspections. Port turnaround times have reduced considerably, and this puts enormous pressure on everyone to complete the inspections in time. Alongside inspections, a number of parallel operations are undertaken in port – crew changes, bunkering, stores, attending to port officials, repairs and maintenance etc. The inspectors often have to work with seafarers who are stretched beyond normal hours of work attending to hectic port schedules. The inspection may include reviewing maintenance history, interviewing crew members to verify their competence and assessing the adequacy of support functions that facilitate operations from the shore side. Apparently, the intention is to make ships safer. But communicating complex and delicate matters in a common language and forming initial trust with those onboard in a short lived relationship is a challenge for any inspector. Given the non-standardised and highly fragmented nature of the industry, regulatory requirements can vary depending on the vessel type, size, trading area, age, flag of registry, etc. Exactly which regulation, code, circular, flag state requirement, industry standard, manufacturer’s recommendation or company procedure applies in what context is not easy to determine, even with all the information available onboard in this internet age. The volume and complexity of regulations seem to have gone through the roof. Take the case of Electronic Chart and Display Information System (ECDIS) for instance. Amongst the many regulations are everything from design, approval, installation, commissioning, operation and training of the end users. As one colleague puts it, the situation is so complicated that for the end user even knowing with confidence if the electronic charts can be termed as a primary means of navigation as against paper charts can be tricky. The primary means of navigation can change between voyages or even during the same voyage depending on the availability of up-to-date electronic charts in a particular area. And this is only one of the many aspects of ECDIS requirement. There is a limit to how much we can expect an individual to know, especially so if this individual is overworked and exhausted attending to the many jobs in port. But this is no excuse for lack of ‘familiarisation’ with the safety management system. There is also the issue of power distance, when a major proportion of seafarers from developing countries navigate through ports in developed countries and deal with the port officials. There is an implicit acceptance of power inequality especially amongst those from developing countries. A prime example of this behaviour emerged when the Chinese container vessel Cosco Busan met with an accident while departing San Francisco in dense fog conditions. A watch officer was overheard on the voyage data recorder saying, ‘For American ships under such conditions, they would not be underway’. This is a powerful statement from a seafarer who feels in the uneven world of global shipping, only certain nationalities can exert authority. Similar examples of submissive behaviour have come up in my own experiences during onboard inspections when the seafarers simply nod and smile to keep the inspector ‘happy’. An interesting aspect of inspections is the constant hunt for broken components, rule violations and human failures. From the inspector’s perspective, it is more important to prove ‘look what I found wrong today’ than ‘see how many things go right every day’ to justify his presence on a vessel. A handful of problems have to be found – this is an unspoken rule of onboard inspections. The format of inspection reports supports this unspoken rule all too well. Most inspection results are based on a negative vocabulary – defects, deficiencies, failure, non-compliances, detentions, (negative). This negative language can adversely affect the morale of crew members who try to get their jobs done with limited resources. What is more, this negative vocabulary instigates fear and insecurity amongst the crew. During an inspection, a non-compliance was raised against a vessel when an engineer was unable to demonstrate the proper functioning of the emergency steering system. His first concern was that if this went down on paper, it would cost him his job. How are we to expect any learning or improvement from the inspections, if the first question raised is who is to be held responsible and who should be fired for the screw-up? Tolerance for human imperfection and technical failures is close to non-existent. But this behaviour is a symptom of deeper problems within the industry. The outcome of inspections plays a decisive role in the marketability of the vessel. In an ideal world, vessel operators should strive for the highest standards of operations and maintenance whilst avoiding the curse of negative inspection results. In order to achieve this, many companies are moving towards ambitious but unrealistic quality, environment and safety targets such as zero accidents, zero downtime and zero spills, so their vessels score better in a competitive market. In practice, however, failures and malfunctions are inevitable when a vessel carries high risk cargoes, navigates in shallow waters, experiences horrendous environmental problems of ice, fog and storms and faces intense production pressures with minimum manpower. If malfunctions and failures are bound to come up during inspections and yet play a decisive role in the marketability of the vessels, what is the way forward out of this impasse? One solution is to set up performance indicators to monitor and control malfunctions. And this is simple! Some companies would set up performance indicators as vague as ‘compliance with mandatory rules and regulations’ and internalise these measures in individual KPIs. 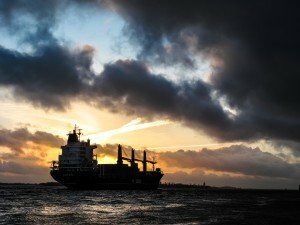 But underneath such broad KPIs there is a powerful message – dispute, negotiate and defend non-compliances, defects and failures because all of these can affect the commercial viability of the vessels and ultimately the staff bonuses. Safety comes in direct contradiction with marketability, and all this can lead to defensive attitudes and conflicts between the inspector and the operator. This is not necessarily being dishonest; it is a practical way in which companies set up targets and manage their vessels – except that it completely undermines the value and purpose of the inspections. Given that safety and environment issues almost always concern the public interest, the logic of independence is deeply embedded in the enforcement regime. This assumption is valid both for internal controls as well as external inspections. The reporting lines for safety departments are kept independent, so that personnel can report directly to the highest level of management without the fear of intervention from commercial and operations. For external regulatory inspections, the role is fulfilled either by public maritime administrations or assigned to third party organisations. While independent assessments are critical in matters of public safety, equally important is the competence of inspectors and the content and substance of the inspection. The content of the inspection report may sometimes tell us more about the biases and competences of the evaluator (inspector) than any genuine reflection of the vessel being evaluated. Inspectors with engineering qualifications focus more on machinery spaces, whereas those with nautical qualifiations often dig deeper into nautical issues. But such biases are to be expected from all human beings including inspectors. In some cases, however, the inspections are carried out with a strict ‘compliance mentality’, and it is here that the inspectors become excessively engaged with petty issues where compliance and noncompliance is easy to establish. Rather than using regulations and rules intelligently to identify and address the risks that are specific to the vessel, the inspectors chose to focus on issues that are obvious to the eye and meet with minimum resistance from the operator. As a result, a typing error on a certificate, a missing entry in a log book, or insufficient frequency of checks (rather than the quality and output of maintenance) become the prime focus of inspections. What is common about such petty issues is that much of this can be picked up and reported from the comfort of a ‘couch’ without engaging with the crew or paying attention to the messy details of operations. Of course not all inspections focus on the obvious, trivial and readily accessible. On the contrary, to ensure technical integrity many inspectors have to enter into claustrophobic, confined and remote spaces (even sewage tanks!) where normal workers would simply refuse to go. But technical know-how and sophistication has increased remarkably in recent years, and so has our struggle to control and deliver on them. Today, computer based technologies no longer show obvious signs of failure and neither do new technologies follow a straightforward maintenance schedule that could be assessed independently by a third party inspector. Failures can emerge without warning, and specialist technical knowledge is often controlled by the vendors and manufacturers who are directly involved in the repair, servicing and inspection of their technologies. Without access to this specialised knowledge, the inspector’s role in technical safety is limited. The scope for technical assessment may become limited to virtual testing and extrapolations. Already, there are far too many examples. We simulate loss of main power to check if the emergency generator would start automatically, lifeboats are lowered at the most to embarkation deck, in calm seas. The FMEA trials dynamic positioning system in sheltered waters, load testing on lifting appliances takes accurate account of load distribution, meta centric height and external influences. These are by and large controlled experiments carried out systematically with meticulous planning, adequate manning, risk assessments, authorised permits, and with the best guesstimate that the technology would function as intended in an unexpected situation. The operational context, however, is harsh, wet, messy, greasy, slippery, corroded, uncertain, dynamic – and nearly always undermanned and overstretched. Would the lifeboats still lower under the influence of gravity, and is the remote closure of watertight doors going to operate as intended when the vessel develops a list and sinking becomes imminent? Isolated testing of technical components says little about system behaviour in an operational context, particularly so when system boundaries are pushed to their limits. These are not matters of access or intelligence of an inspector; they are issues that require a shift of thinking – one that involves a focus on safety risks that are specific to the context, and delivering inspections that are sensitive to those risks. Put simply, without context even the most detailed technical inspection runs the risk of adding marginal value to the management of safety risks. The unfortunate state of enforcement that I have described in terms of boxing and dancing needs serious action. But serious action does not mean yet another set of regulations waiting to be rolled out. An Argentine shipmaster once said to me, ‘Today, if I wish to install a toilet seat on my vessel there will be endless queries, risk assessments, and certificates. But if I tell my company that my crew needs some rest before we sail out from the port, no one would respond. There is too much administration but very little policing’. As this Master has correctly pointed out, the situation in global shipping today requires intelligent political intervention, and not increased administration. Call it smart regulation or simply inspections with a meaning and fit for purpose. Examples can be drawn from high risk industries such as the nuclear sector or the oil and gas industry. Here, compliance with rules and regulations is driven by a larger purpose such as the prevention of major accidents or matters concerning organisational reputation. This could also be achieved in the maritime industry through the use of the ISM Code as a risk management tool rather than a mundane compliance exercise. The fundamental difference is that safety is no longer seen as an evil against marketability and profits, as but an integral part of cost saving and risk taking. In short, business is safety. To achieve this requires a move towards designing smart and focused SMS (safety management systems). And for this, key operations (section 7 of the ISM Code) should be placed at the heart of the SMS. Here, key operations should not be mistaken for generic shipboard activities such as navigation, cargo operations or bunkering but the core business of an organisation (for example delivering just-in-time cargoes, safe carriage of dangerous pollutants, search and rescue operations, pipe laying or exploration and drilling). Starting from this point makes so much business sense when every initiative, control measure, resource and KPI is developed bearing in mind the (operational) context and assessed with a purpose, whether it is internal audits, reporting lines, competence management, procedures for routine and non-routine tasks, emergency preparedness, technical safety or organisational learning. Take the case of emergency preparedness – sudden loss of propulsion can have very different consequences on a container vessel operating within just-in-time constraints than an anchor handling vessel carrying out rig moves. The former may cause delays to operations and may or may not undermine navigational safety, while the latter clearly has the potential for a major accident. 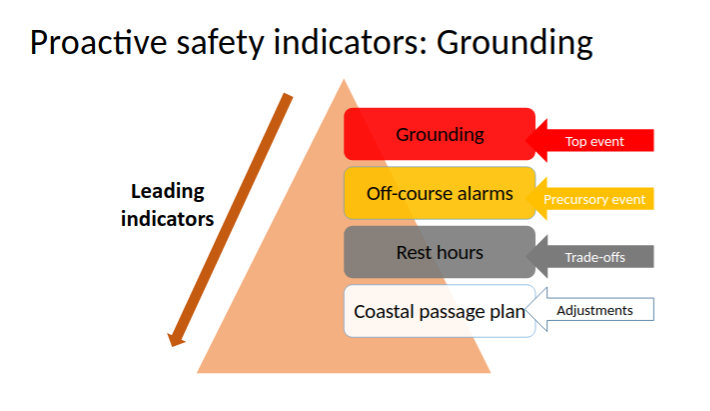 Similarly, for a company operating deep draft tankers concerned with safety of navigation, meaningful indicators of safety become clearly identifiable – adjustments to passage plans, off-track alarms, rest hours of crew and the adequacy of the Shipboard oil pollution and emergency plan (see figure below). It is here that we start to get a clear sense of compliance with Marine Pollution Convention, Safety of Life at Sea Convention, Standards of Training, Certification and Watchkeeping at Sea, etc as a tool for managing the risks, rather than as compliance for its own sake. Equally important is that the enforcement regime should move beyond a culture of negative reporting i.e. non-compliances, failures, defects, detentions and human errors. Rather, the focus should be on understanding how, despite all the environmental, social and technical obstacles, people generally succeed in carrying out their jobs. This leads to an entirely different and motivational language of safety, one that is characterised by every day trade-offs, adaptability, adjustments, or ‘seamanship’ – and one where human performance is seen as a solution and not the problem. Hidden in this term ‘human performance’ are endless stories of success – but also those that could potentially lead to failures. It is not difficult to figure this out on a vessel where seafarers often find ways to carry out tasks differently than set out in procedures and rules, due to lack of resources, unstable work environment, time pressures, inadequate procedures and substandard designs of vessel and equipment that leave no choice but to violate those procedures. What is required from a meaningful inspection is a degree of open mindedness to understand the underlying reasons for the gap between procedures and practice – rather than just highlighting those gaps. There will always be organisations that choose to hide behind compliance, content with addressing petty issues of marginal relevance. But experience has shown that there are also companies operating at the higher end of the value chain, where the emerging trends of ‘boxing and dancing’ are seen as counterproductive both for safety and business reasons. These are companies that demand constructive tension and value for money from the representatives of enforcement regimes. The senior management view safety as a business opportunity. In such organisations, absence of evidence (of harm) is not mistaken for evidence of absence. Change is within our reach. Hi Bill, thank you for your question. I believe examples of inadequacy of regulation / enforcement regime can easily be drawn from most major accidents but that is not really the point. That would mean that we learn mostly from the severity of a case. My examples are mostly drawn from everyday interaction with workers on the ships. To me frequency of normal interactions is more important that the severity of an odd case of accident. An inescapable fact is that the character of an industry/ technical community is largely a reflection of the character of its regulators, and, of course, vice versa . Competence, integrity, compliance, and transparency or their lack seldom exist on only one side of an industry-regulatory interface . I would encourage you all to read this article … Great post. Almklov, P. G., et al. (2014). “When safety science meets the practitioners: Does safety science contribute to marginalization of practical knowledge?” Safety Science 67: 25-36. An inescapable fact is that when an oversight agency has been embarrassed by the revelation of outrageous incompetence, lack of integrity, noncompliance, and/or lack of transparency by one overseen entity all similar overseen entities are punished in some way by the same and similar oversight agencies . Observation: Sultana and Titanic resulted in enormous cost increases in the steamship business and continue to do so. PAPod 221 - HPRCT, Charles Major, and Scaling Operational Excellence. Safety Moment - Say it and believe it. Get Caught Trying to Make the World Better! Best Safety Podcast, Safety Program, Safety Storytelling, Investigations, Human Performance, Safety Differently, Operational Excellence, Resilience Engineering, Safety and Resilience Incentives Give this a listen. Thanks for listening and tell your friends. See you on Amazon buying The 5 Principles of Human Performance. PAPod 220 - Sneak Peek on The Big Discussion - Thanks for Being a Part of this Event. Today on Safety FM, Jay interviews one for the founding father of Human & Organizational Performance. Tony covers his career and how the development of H&OP occurred. Enjoy the interview today on Safety FM. Mini - What Are Your Goals? Today on Safety FM mini, we talk about goals. Do you have goals? Let's dive a little deeper on this subject. On today's episode of Safety FM, we discuss with Angie Bruhn. Angie is an executive​ coach, organization leadership consultant and motivational speaker. Listen about Angie's journey, here on Safety FM. On today's​ min episode we discuss being The Voice of The Voiceless, here on Safety FM. Why do things go right? Proudly powered by WordPress | Hosting by AirTight.